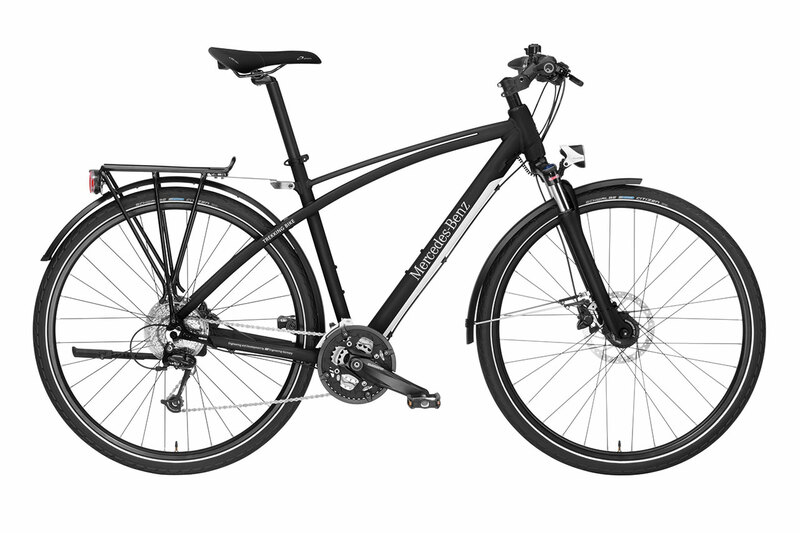 Upscale cycling with Mercedes: the Trekking Bike 29 is the latest high-quality addition to the Mercedes-Benz Bikes 2013 line-up. Like the Fitness Bike 29 unveiled last year, it has large wheels to provide greater traction, smoother running and better ride stability. 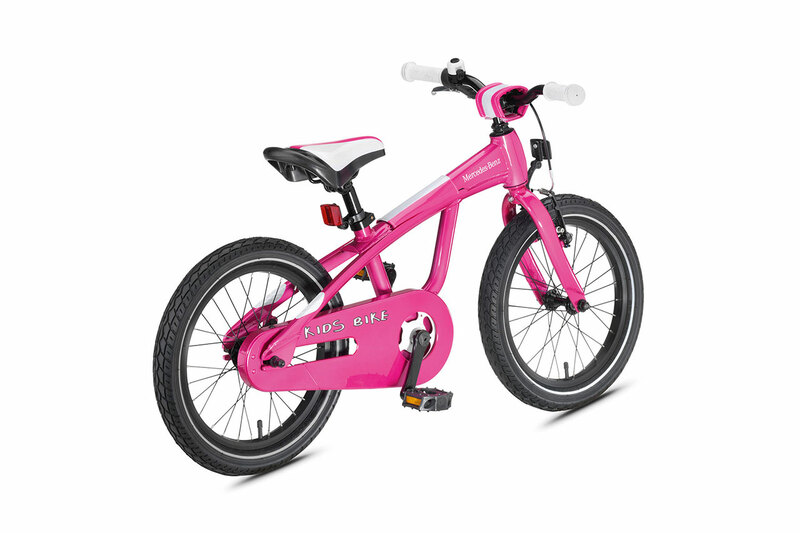 The 2013 range also includes a mountain bike with full suspension and the exceptionally versatile Kids' Bike, which easily converts into a balance bike. 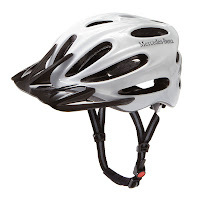 High-quality cycle wear and an extensive range of accessories are also available. All Mercedes-Benz bikes and accessories boast contemporary, innovative technology and the high level of quality that is synonymous with the Mercedes-Benz brand. The bikes are developed and produced in collaboration with the Hesse-based premium bike manufacturer ADP Rotwild. 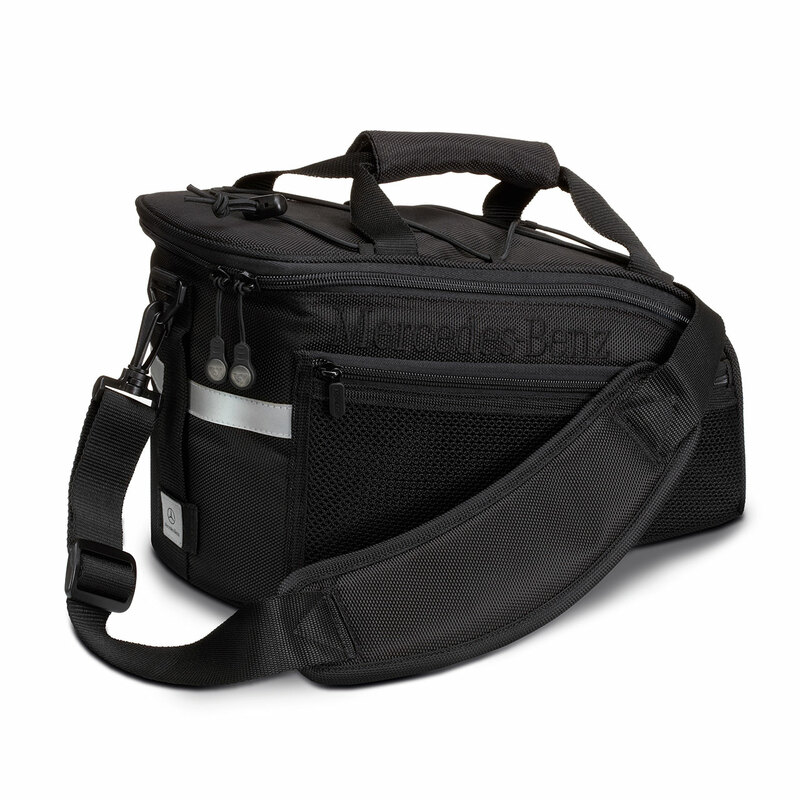 For the accessories too, Mercedes has joined forces with renowned manufacturers including uvex, deuter and SIGMA. The new Trekking Bike 29 features an exclusive Mercedes-Benz frame with 29-inch wheels, a high-quality 27-speed DEORE gear shifter and hydraulic disc brakes by Shimano. The Suntour NCX-D LO suspension fork has a travel of 80 mm and is lockable. The Trekking Bike 29 is supplied fully equipped with lights, mudguards and a Topeak rear carrier. It weighs around 15 kg. The Trekking Bike 29 is priced at €1399  and is available in frame heights of 49/52/55 cm and in an exclusive matt black colour. A three-dimensional chromed Mercedes-Benz star is mounted on the front of the bike frame. 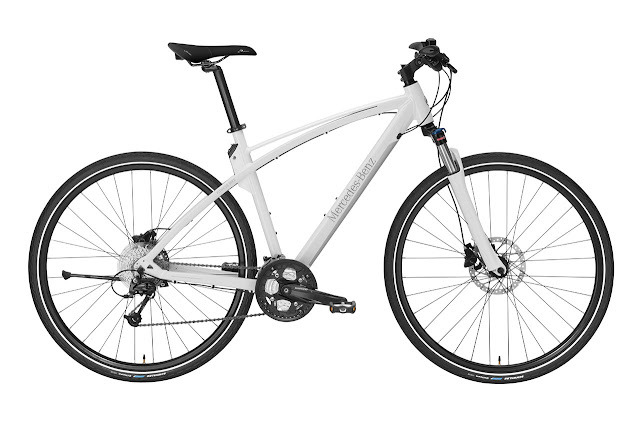 The Fitness Bike 29 launched last year has been technically adapted in line with the new Trekking bike and now features a high-quality 27-speed Shimano DEORE gear shifter. It is also equipped with a lockable Suntour NRX-D LO suspension fork with 80 mm travel, hydraulic Shimano disc brakes, Ergon handlebar grips, an angle-adjustable stem and a high-quality Phorm saddle for outstanding comfort even on longer rides. The white/silver colour combination emphasises this bike model's sporty character. The Mercedes-Benz Fitness Bike 29 is available in three frame sizes (49/52/55 cm), weighs around 14 kg and is priced at €1199. All Mercedes-Benz Fitness Bikes from model year 2007 onwards can be retrofitted with the aluminium rear carrier (with a payload of around 7 kg). It can be mounted easily without tools and is priced at €59.90. Designed specifically for the rear carrier on the Trekking Bike and Fitness Bike, the pannier is made of black nylon with a high-quality DuPont™ Teflon® coating. One of the pannier's stand-out features is the fact that it can simply be pushed onto the rear carrier and locked firmly in place by means of a click mechanism. The main compartment and two side compartments provide a total capacity of seven litres. Additional features such as a shoulder strap, carry handle, 3M reflector stripe and bungee cords make the pannier a very handy accessory. The pannier measures approx. 32x20x20 cm (LxWxH), weighs around 0.8 kg and is priced at €59.90. 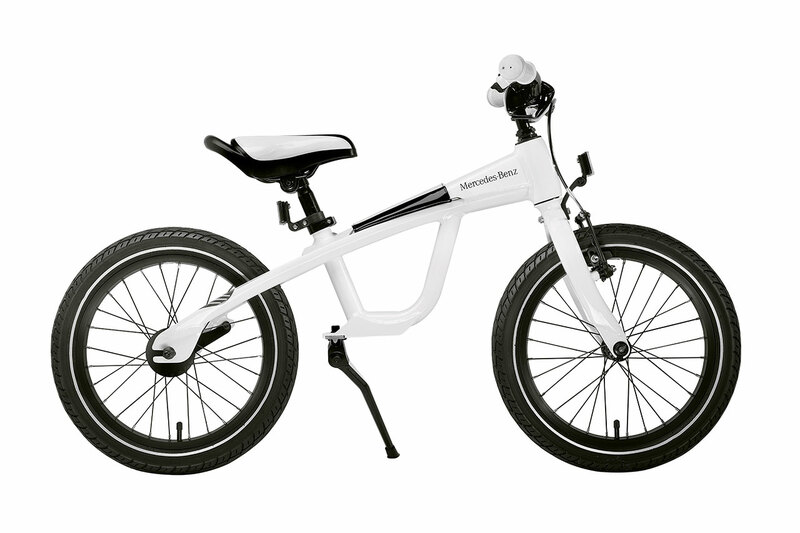 With its robust aluminium frame, the versatile Kids' Bike provides a particularly snazzy means of introducing youngsters to the joys of bike riding. Its 2-in-1 concept enables swift and simple conversion from a 16-inch children's bike into a balance bike. As a balance bike, it makes toddlers' first attempts at riding a bicycle a particularly easy and fun experience, trains their sense of balance and makes the eventual switch to riding with pedals substantially less daunting. 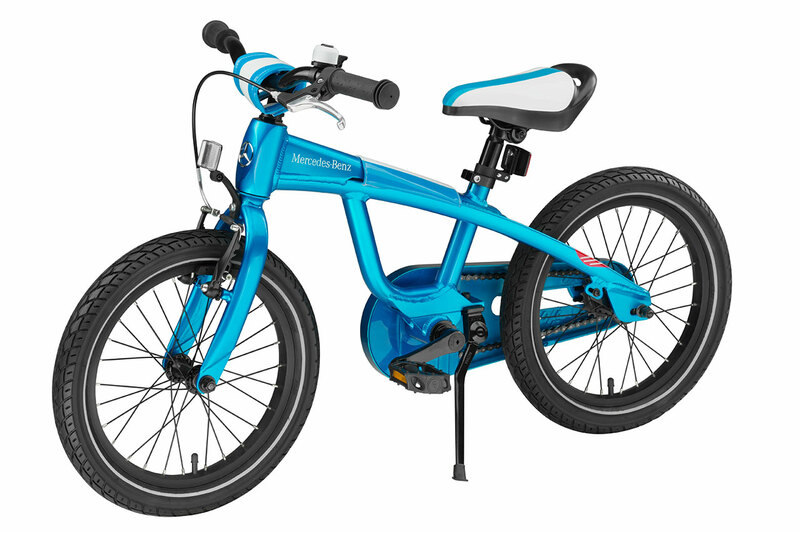 For 2013, the Kids' Bike comes in a choice of three colours: a new blue metallic shade to tie in with the colour palette for the new A-Class or, alternatively, white or pink metallic. It is suitable for children of between three and around six years of age (seat height adjustable from around 50 to 60 cm) and is priced at €299.90. 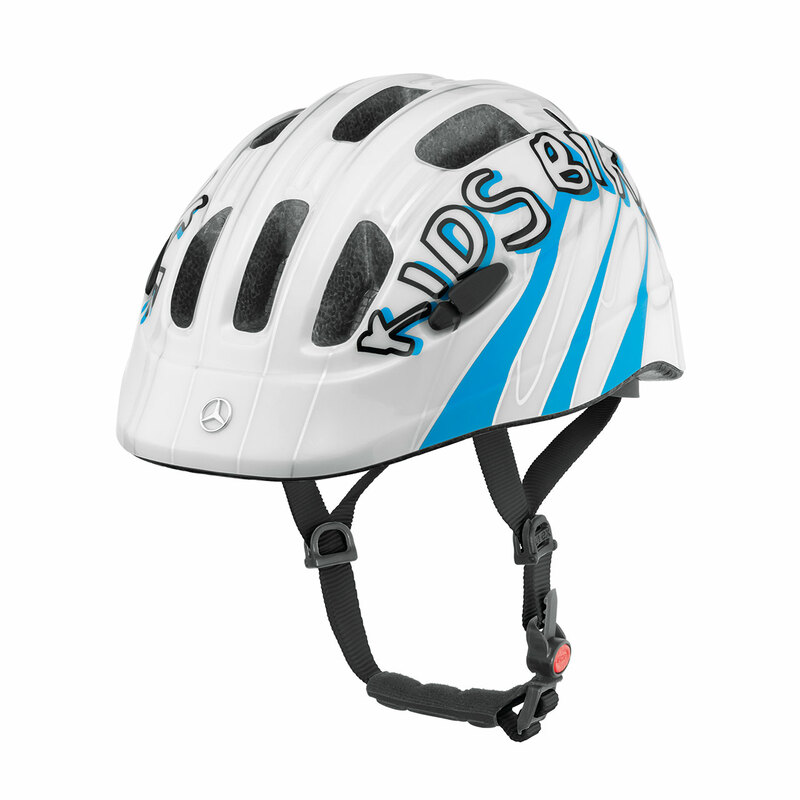 There is a matching children's bike helmet by uvex in blue metallic/white with the Monomatic fastening system and red LED light available priced at €53.90. Accessories include easily mountable stabilisers (€14.90). 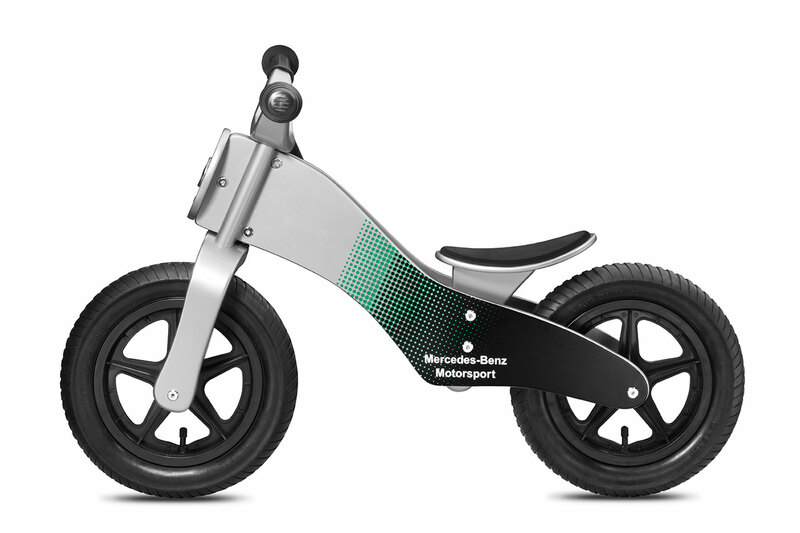 Alternatively, children aged around two or above can get their first taste of riding on two wheels on the wooden balance bike, which sports a Mercedes-Benz motorsport look in silver, petronas green and black. The 12-inch wheels have plastic rims and the seat height is adjustable from 32 to 36 cm. This bike is priced at €129.90. Another star of the 2013 Mercedes-Benz Bikes line-up is the All Mountain mountain bike, which really comes into its own in off-road terrain. A Fox Racing F 32 RL suspension fork and a DT M 210 Swiss fork leg with front and rear spring travel of 120 mm and 125 mm respectively make for efficient and safe handling. This model features a 30-speed SRAM X.7/X.9 gear shifter and an Avid Elixir R hydraulic disc brake system with 185 mm discs. The 26-inch DT Swiss X1900 wheels round off the functional package. 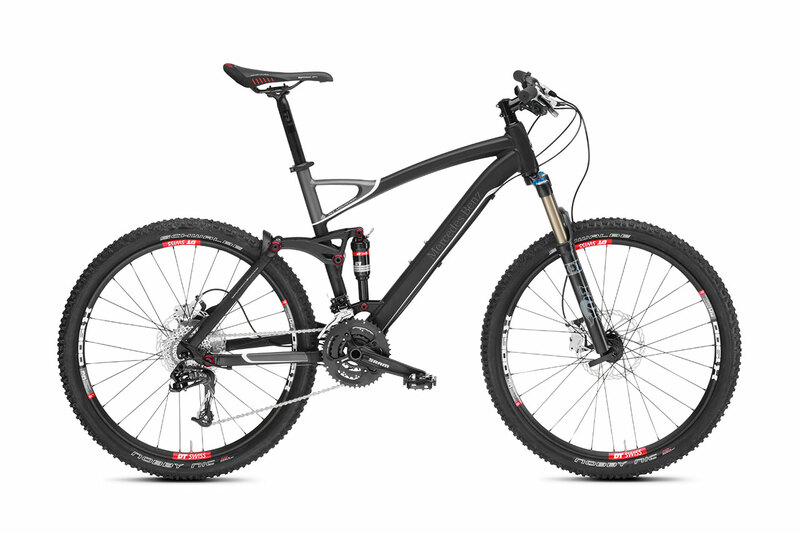 The Mercedes-Benz All Mountain mountain bike weighs 12.8 kg, comes in a choice of three frame heights (47/50/53 cm) and is finished in a matt black/anthracite/white colour combination. It is priced at €3299. Accessories include Topeak mudguards made of injection-moulded nylon. The rear mudguard attaches to the seat post by means of quick-release fastener, while there is an adapter for fastening the front mudguard to the suspension fork. The mudguard set is priced at €39.90. 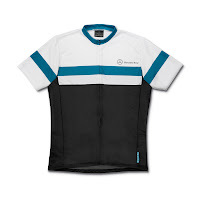 New to the 2013 range is the men's' cycling jersey in a black/white/petrol colour combination. It is made 100 percent of breathable fast-drying polyester, has three rear pockets, including one with a zip fastener, and it features sports reflector piping. A Mercedes-Benz star and lettering provide brand identity. 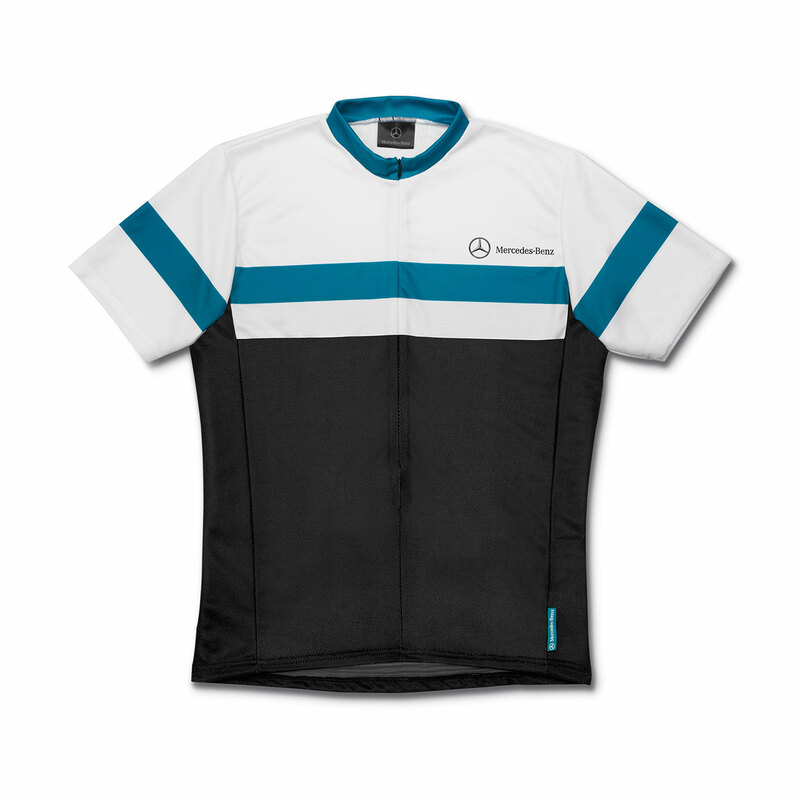 The jersey is available in sizes from S to XXL and is priced at €64.90. Robust Topeak prop stand made of aluminium and stainless steel for simple attachment to quick-release mechanism. The stand (€99.90) facilitates maintenance of all bikes, can be folded to save space and has a load capacity of up to 90 kg. 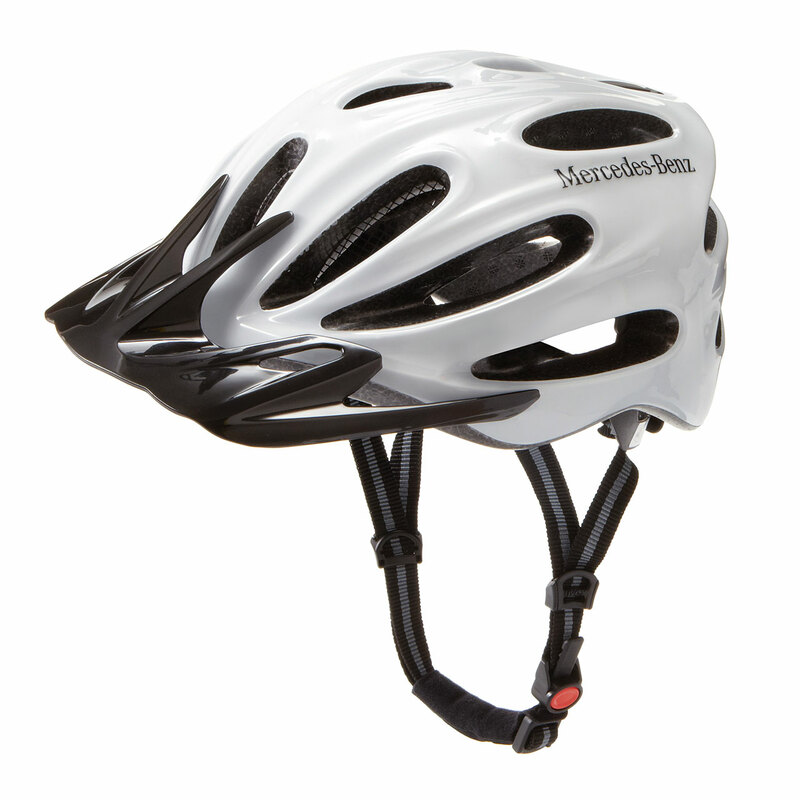 Mercedes-Benz Bikes 2013 with accessories and cycle wear are available from authorised Mercedes-Benz partners.